* then post the three sentences that follow that fifth sentence on page 123. 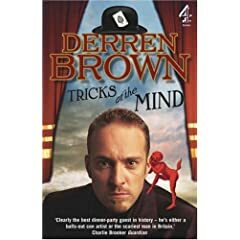 The book I’ve been reading, and meaning to get through for some time now, is Derren Brown‘s Tricks of the Mind. Brown is, of course, the famous magician/illusionist/hypnotist/someone who plays tricks with our minds and in this book he shares some of this thoughts. It is funny, witty and — if you delight in seeing charlatans and new Age types being unspun with a liberal does of critical thought, is just the kind of book to delight your impish impulses. If you understand that you’re more dalem than me. In the meantime Unspun though he’d perpetuate the fun by tagging Wicaksono and Indri and Rani, assuming that their bananas are in good condition. Derren Brown is amazingly scary. Saw few of his shows and he’s a combination of a person with a photographic memory, mathematically brilliant, and super talented with fast hand. He’s banned from every casino and betting places because, well, guess, what, he could predict who would win! *grin. @Anita: Then you should pick up the book because he discusses things like photographic memory – he does not have one – but he does have a system or two to help him remember. Hmmm, maybe we can hire him to go to Genting.